In this spirit I made my pilgrimage to Tunis. I wanted to reflect on new struggles, but what I found were inflexible and outmoded structures. It was only in the cracks — the spaces in between — that I found the possibility of another world. In 2000, at the height of the alter-globalization movement, activists attempted to shut down the World Economic Forum at Davos but were derailed by the Swiss government. In light of this defeat, a coalition of Brazilian organizations with ties to the Workers Party and activists from ATTAC-France stepped away from direct confrontations and opted for a counter-summit in the global south in which NGOs, trade unions and social movements would come together. They called this event the World Social Forum. After that, a charter was written outlining the World Social Forum’s purpose, which included being an open, de-centralized, non-party and non-governmental space for cross-cultural exchange of experiences. In addition to the charter there was a desire to extend the planning process to other groups. Thus, an ad hoc body called the International Council was formed with representatives from over 100 NGOs and trade unions. In subsequent years, the International Council became the de facto steering committee of the World Social Forum. The forum continued to meet regularly and grew in attendance, but it faced many challenges. Hosting tens of thousands of people from across the globe required mobility, coordination, cooperation of local governments and financial resources. As a result, organizations with ties to governments and access to large sums of corporate money were able to play a major role in the forum. This also meant that social movements — especially those that levied radical critiques or came from impoverished communities — were left with less leverage in the process. At the 2007 World Social Forum in Nairobi, Kenya, for instance, there were protests against its inaccessibility. The venue was located far outside the city, and the gates were guarded with military force. The radio transistors meant for translation did not work. Worst of all, the cost for entry was too high for most Kenyans to afford, and the fees for vendors precluded local businesses while favoring corporate contractors, including Coca-Cola. Over the years, some progress has been made with regard to entry fees and translation, but the forum remains a contested space. Most of us who participated in the movement of squares — from Tahrir to Puerta del Sol to Zuccotti — had never met in person. I had the chance to meet a few of my counterparts at the Agora 99 meeting in Madrid and at Firenze 10+10, the most recent European Social Forum. 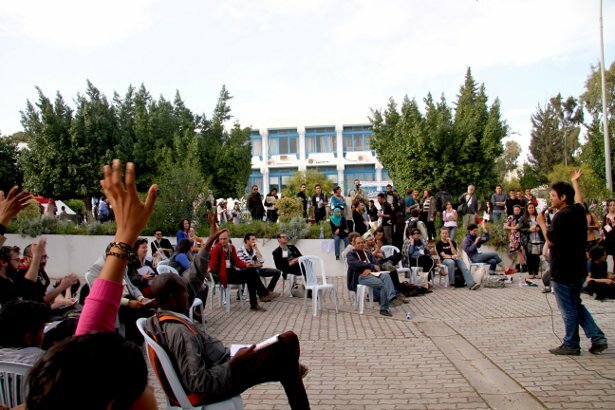 Out of that experience came a group that planned to attend the World Social Forum in Tunis. We saw an opportunity to coordinate with one another, to learn from our experiences and to open up the forum process. In the lead-up to Tunis we connected over e-mail, collaborative writing pads, and a series of Mumble conference-call meetings. Our stated purpose was to work “toward, around and beyond the WSF.” We called ourselves Global Square. Upon arriving in Tunis we made our way to the forum site at University El Manar on the edge of the city. As a sprawling archipelago of buildings cordoned off with imposing green gates, it resembled a military compound more than a place of learning. Tunisian workers with WSF badges stood guard asking for our passes. The cost of registration was on a sliding scale according to region, favoring North Africans. This arrangement was an improvement over the past, but to organize events within the forum required such things as tents, sound systems and translation equipment, all of which cost hundreds of euros. This prohibited low-income people and those with language barriers (such as Tunisians) from convening their own discussions. Instead, they could only attend meetings others had organized. Global Square made contact with the commissions established by the International Council before the forum began. We were promised space for our events, tents, translation assistance and a free sound system. But none of this materialized. The square was located inside the Climate Space, where there were socially responsible and eco-friendly workshops sponsored by Petrobras, the Brazilian oil giant. The workshop led by Mova Brasil, a literacy project for young people and adults, for instance, was developed in direct partnership Petrobras. 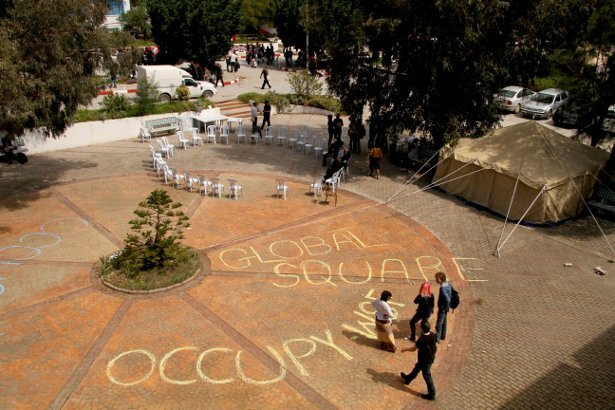 Our occupied square, while a bit haphazard, had none of these corporate strings attached, and the result was a truly open space for cross-cultural dialogue. We could handle translation ourselves because we were an international group; every day we held open assemblies with translation available in English, Spanish, Italian, French and Arabic on an as-needed basis, and that seemed to work. We held workshops on facilitation, tactical media and open assemblies in which anyone could speak regardless of organizational affiliation. 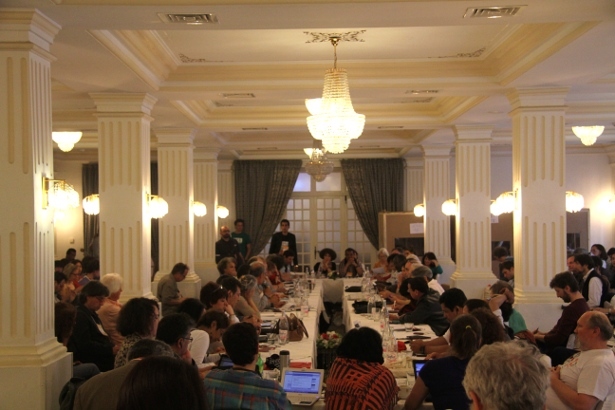 After the forum, the International Council began a series of meetings to plan the future of the council and the World Social Forum. The meetings were held at the Hotel Majestic on Avenue de Paris in downtown Tunis. After experiencing the forum I wanted to see its organizers in person. After entering I was led by a security guard to the conference room. The room was arranged so that all International Council members were in the center around a boardroom table draped in white fabric and lit by chandeliers. It was made clear that only council members could speak; the rest of us could merely observe. At the International Council meeting there were hours of speeches by representatives of various trade unions and NGOs who all expressed their disappointment with not getting what they wanted out of the forum. Then Whitaker spoke and delivered his proposal — his self-described “bomb.” The facilitator cut him off, announced a lunch break and explained that the International Council members would eat first, followed by the rest of us. After break, council members announced that they would allow people other than themselves to take turns speaking, so some participants in Global Square got on stack. They were placed at the very end and given three minutes each to speak. Saif, a 15-year-old Tunisian boy who had been coming to Global Square, said, “I just have one question: Why do the capitalists have an anti-capitalist forum?” Shortly thereafter, the meeting came to a close. Some of us from Global Square remained in the room to debrief. We picked up microphones and pretended to be International Council members. We joked about forming committees for committees. Then, in a spontaneous act of occupation, we removed the table, rearranged the space and made a circle. The hotel workers were laughing along with us. They even helped out by checking the sound system. The next morning the International Council members came and sat in the circle, giving no indication that the new format wasn’t intentional on their part. They made vague statements concerning the critiques made the day before, and then they went on with business as usual. They formed committees in which there was much discussion, but the only decision made was to meet again in six months at a location yet to be determined. After returning home to New York, I am uncertain what the future holds for the World Social Forum. The convergence has been a catalyst for movements around the globe to connect for more than a decade. However, it continues to face many crippling problems. If there is to be another World Social Forum, imbalances of power must be addressed much more deeply. It must be mobile and de-centralized, utilizing new technologies to broaden participation. Resource allocation must be critical and democratic. The roles and tasks of the organization must be made visible and accountable. Only then will the forum achieve a horizontal space. It is clear, even to International Council members themselves, that a new direction is needed. But they are too comfortable in their current structures. Bringing about change will require them to face the contradictions of their own power. I hope that they take this opportunity to learn and grow from the “new movements” that inspired them to meet in Tunis in the first place.